Nvidia has just released a new video driver version – GeForce 306.97 and what is interesting about this release is that it is also Windows 8 WHQL-certified driver, it will of course also work for Windows 7 and Vista users. The new Windows 8 OS launches later this month on October 26th, so it is almost here and while waiting to see how will Windows 8 influence stereo 3D with its native stereoscopic 3D support we can take a look at what these new drivers bring for stereoscopic 3D gamers using 3D Vision. Aside from official support for the just launched GeForce GTX 650 Ti Kepler GPU and the WHQL status the new driver brings mostly updates for 3D Vision profiles. The most notable thing here is the Excellent rating that the upcoming Doom 3: BFG Edition has received, especially considering the fact that the game should be using an OpenGL-based game engine… and it would be playable on 3D Vision (guess how). There are a few more days until the official release of Doom 3: BFG Edition, it is expected on October 16th in North America and in Europe on October 19th. Doom 3: BFG Edition is the first game announced to come with support for the Oculus Rift 3D VR headset, the first development kits of which are expected to start shipping some time in November/December. On a side note I just got a request to enter my shipping address for the early DIY Dev kits of the Rift scheduled to be sent to backers of the Kickstarter project sometime in November, so apparently things at Oculus are progressing well. If you are still not using the Nvidia Update feature of the more recent graphics drivers then it is about time you start doing so as starting this month (July) Nvidia has started to release 3D Vision profile updates through it. 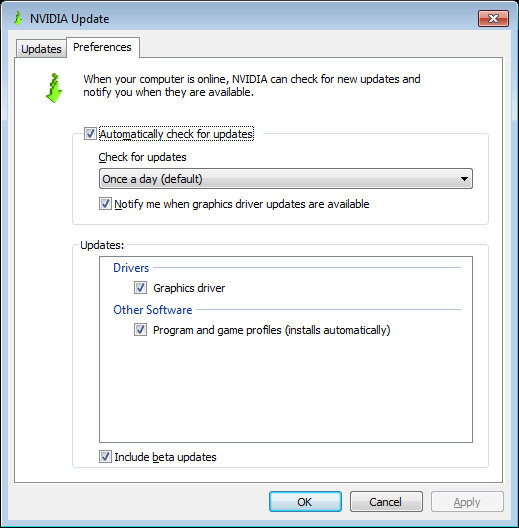 By default, Nvidia Update will check for all updates for Nvidia software including drivers and profiles, but just to make sure you can go to the Preferences tab of the Nvidia Update (if installed you should see an Nvdia logo icon in the Windows Taskbar) and see if under Updates the option Program and game profiles is enabled (it should by default). Thanks to the automatically updated profiles you can always stay up to date and not have to wait for a new driver to be released in order to get better support for a game or to get proper 3D Vision support for a new title when played in stereoscopic 3D mode with 3D Vision. Here is a recent example, the latest WHQL driver did not include a 3D Vision profile for the game The Secret World, the latest beta did have a profile, but it rated the game as Not Recommended and if you are using the Nvidia Update to get the latest 3D Vision profiles there is an updated profile for The Secret World where the game is already rated as Good. A word of advice for the game Q.U.B.E. that is rated as excellent, the game kind of reminds of Portal in style and is actually quite fun and works really well in stereo 3D mode, however similarly to Portal the color palette in the game is often highly contrasting and this can lead to experiencing more crosstalk than usual. Also the new driver does add SLI profile for the upcoming game Mass Effect 3, but there is not yet a 3D Vision profile or rating for the game, and the previous games from the series had some issues in stereo 3D mode. Mass Effect 3 has the potential to turn out to be a great game to play in stereo 3D mode if it works properly this time, so hold your fingers crossed for when the game becomes available in March this year. → 4 CommentsTags:295.51 Beta·3d vision·3d vision profiles·3D window mode·Mass Effect 3·Q.U.B.E.